Over at the Craft blog today, I briefly reviewed Speed Knitting by Kris Percival, to coincide with the free download of the “Scenester Scarf-Hat” pattern from that book. Here are my build notes for that project, with some advice and things to look out for along the way. Though this description is a little vague, my experience is that the yarn you use in this project can’t be fluffy or bulky enough. Though I’ll admit I’m a fairly tight knitter, I used Wool-Ease “Thick & Quick,” which the label describes as “super bulky weight,” and my gauge didn’t quite measure up (see next section). My advice is to as big as you can. Though the pattern calls specifically for circular needles, they’re really not necessary for this project. Because you won’t work anything in the round, straight needles would work just fine. Since I prefer circulars anyway and didn’t have any size 15s in any style, I went ahead and bought the circulars, as directed, in the 29″ length. You’ll need each of the tape measure, scissors, yarn needle, and stitch holder at least once. Okay, got everything together? Let’s get knitting. Because I’m impatient and don’t like dawdling when I’ve got an exciting project to try, I used to never bother checking my gauge. But, as any knitter does, when I started to knit more complex and lengthy projects, such as sweaters, I realized the importance of making sure I was starting out on the right track. If your gauge doesn’t match what the pattern designer is expecting, you’re bound to have a mismatched mess of a finished project. Like most patterns, this one has the gauge right there on the first page, but somehow I didn’t notice it (guess I was moving too quickly). Since the condensed steps seemed to suggest a preference for just the essentials, I assumed no gauge was included and just started knitting (this is supposed to be speed knitting, after all). After trotting along quickly, I’d just about finished the first half of the scarf before realizing the pattern did include the gauge and that I wasn’t hitting it. So, before you begin, check the gauge (~1.5 stitches per inch) and the “Finished Dimensions” guidelines in the sidebar on the second page of the pattern (page 26 in the printed book). You’ll see that your scarf should be about 6.5″ wide. Mine was closer to 4″, but I was cruising and on a deadline, so I didn’t look back. Anyway, I’m told skinny scarves are in. But if a wider scarf is important to you and you too come up short, you might need to add a few stitches to get the desired size. The pattern says to cast on 10 stitches, but as I mentioned in the previous section, you might want to go with a few more if you’re concerned about your scarf being too thin. See my little How to Cast On post if you need a refresher. (Casting on is also covered in the book’s reference material, on page 108). I’d intended to include that tutorial here, but then I figured it wouldn’t really be essential for most people. Now, it’s time to start knitting up the piece. Don’t be thrown off by the term “reverse stockinette stitch.” It basically just means that the purl side is the “right” side and the knit side is the “wrong” side. But when you’re knitting your first row, this doesn’t really make much of a practical difference. So, just start knitting in stockinette (knit one row, purl one row) until you get to six inches. After ending with a purl row on the “right” side, you’re going to just start purling on the next row, which will be on the “wrong” side (i.e., back to stockinette stitch, dropping the reverse). You can also safely ignore the instruction to mark the last row as folding point. Trust me, the fold line will be obvious. Sorry if my clarification is just as potentially confusing as the pattern. 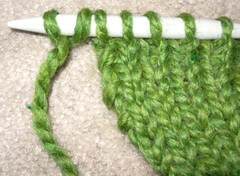 All you really need to know is to do stockinette stitch. 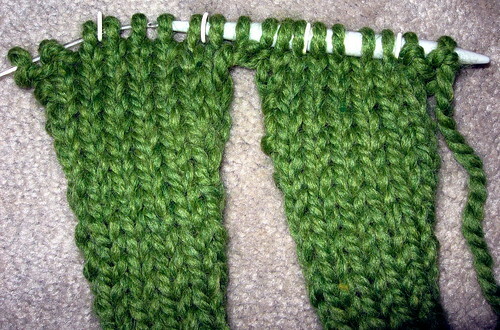 When you purl two consecutive rows, the side you want to show to the world will reverse. After the pocket is folded up, the stitches will be consistent if you keep on stockinetting from the fold. From here on out to the end of the scarf, you’ll be “slipping” the first stitch on each row, which just means inserting the needle into the stitch as if to knit and then sliding it off without actually knitting it. As far as I can tell, this touch just gives a nice selvage to the piece. “Knitting two together” is perhaps the easiest way to decrease (just as it sounds, put the needle through two stitches, the leftmost one first, and knit them as if they were a single stitch). You’ll do it twice on this row, once at each end, to bring your stitch count down to 8 (if you started with 10, as per the instructions). It’s customary to do increases or decreases on a right-side row, so the next row is a purl row and step 08 asks you to decrease one more time, before continuing to the end of this side of the scarf. Here’s where that stitch holder comes in handy, to tuck this side of the scarf away until we’re ready for it again. Leaving the yarn attached, as instructed, would make fine sense if you were indeed using four skeins of yarn, but I was using two huge skeins and didn’t want to start over with a new one on the other side. So, I cut the yarn here, which didn’t seem to be much of a problem. Then, do the other side just as you did the first. 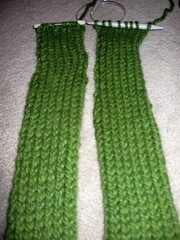 Before joining the two sides of the scarf, you’ll need to add two stitches to the end of the row on the second side. 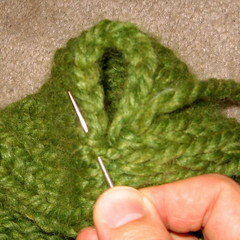 The easiest way to do this is with a mid-row cast-on (really, just twisting yarn to loop around the needle). When I joined the sides together, I just kept knitting with the yarn from the second side of the scarf, rather than picking up the yarn that should have been attached to the first side. Didn’t seem to make a difference when I weaved in my ends later (step 21). This row just sets up your markers, which tell you when to increase or decrease in the steps that follow for shaping the hood. Though the second and third markers were necessary for that purpose, I didn’t find the first and fourth very helpful at all. If you can remember to make sure to knit the first two and last two stitches of every row (and the pattern reminds you to do this with every step anyway), regardless of whether you’re on the right or wrong side, you can safely ignore these markers and just substitute “first” for “second” and “second” for “third” in the rest of the pattern, which is what I did. If you’re concerned about forgetting to do this, go ahead and keep those markers. Otherwise, you’ll mess up that nice edge for your hood. These increase and decrease rows are pretty standard fare, but I’m going to reiterate my warning about gauge here. If your gauge was coming up short when you started and you didn’t do anything to fix it, realize that your length will be off too, not just your width. This didn’t make much difference for the scarf, because the instructions had you knit to a specific length anyway, but the instructions for the hood assume your gauge is correct and base when (and how many) to do your increases based on that gauge. Because my gauge was off, I ended up with a hood that was a skoche narrower than I would have liked, and I had to knit more rows than the pattern called for just to get to an appropriate length (which also meant that the increases and decreases weren’t in the ideal spots for shaping). Don’t make the same mistake I did. But if you do, space out your increases and decreases a bit further apart. 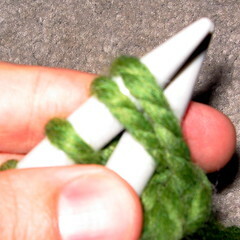 The instructions behind this two-word step (“Bind off”) are covered on page 112, in the reference material. This is another one of those basic knitting techniques I used to always have to look up for every project, mainly because you only do it once to a few times per project. Don’t be too shy or embarrassed to look it up. Making seams is also covered well in the reference material (pages 120-121), but I must admit that, until I actually bound off the piece, this instruction had me scratching my head a bit. The pockets were pretty self-explanatory, but I thought “seam hood” could have used an illustration, perhaps like the one on the right. Basically, to finish the hood, you need to fold the edge over itself (left bound-off edge touching right bound-off edge) and stitch a seam back to the spot they call the fontanelle in babies (don’t know if it has a name in adults). Doing this makes it look much more like a hood and much less like a napkin placed on the top of your head, so I’m glad I eventually figured it out (you astute knitters probably picked this up without having to be told, but I’m nothing if not thorough and self-effacing). Even if you followed your gauge and are happy with the width of your scarf and hood, you still might want to block the piece (blocking is covered on page 124 of the book). With such a narrow piece, the unavoidable edge curl of stockinette stitch is very noticeable. Blocking won’t get rid of it completely, but it will help minimize it a bit. And that’s it! I hope this overly long post about my experience with this pattern has been helpful. If you have any questions, please go ahead and ask, and I’ll do my best to answer them. 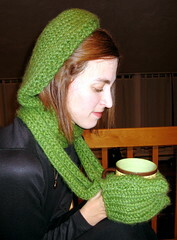 And if you knit your own Scenester Scarf-Hat, please let me know, and send pictures! Thanks for the tips! I want to try this pattern too but I’m using a thinner yarn and smaller needles so it’s good to see more pictures. I just finished this pattern and I really found it left a bit out. I really could have used a row gauge or length measurement on the hood. One tip I have is that instead of binding off and seaming, I used a kitchener stitch to graft the hood together. I really love how mine turned out. 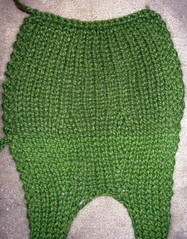 I used 2 strands of yarn- Knitpicks Sierra and Knitpicks Suri Dream. It’s just so cozy! thanks so much for explaining this pattern. i couldn’t remember where it came from and then i was so confused by some of the pattern instructions–thanks for the pictures! Thanks for the illuminating instructions. I knitted this with Rowan Big Wool and size 15 needles. The original pattern, by Percival, I thought was very poorly written (just because something is supposed to be quick to knit doesn’t mean you have to skimp on essential directions). I, too, was extremely puzzled by where to sew it together, and how, and was frustrated by a lack of instructional detail and diagrams. When I finally seamed it together, even though I basically hit the guage markers, I was unhappy with how skimpy the hood looked, so I picked up stitches all along the hood and knitted about 6 rows of garter stitch. I definitely improved the look of the piece and caused the hood to look more curved and “hoody-like.” I am also planning on lining the hood and backs of the scarf pieces with polar fleece in a complimentary color. 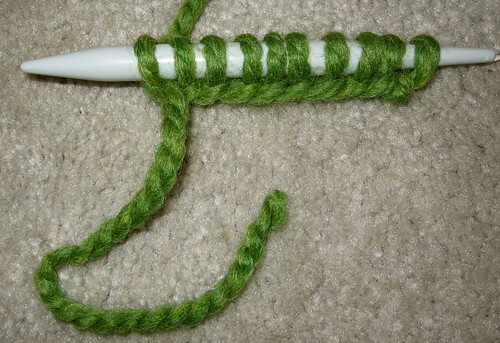 Instead of buying knitting markers, on any size needle you can use a little tied circle of contrasting yarn to slip on and off during the rows you are knitting (just as you do a metal or plastic marker piece). The yarn can always be just the right size! I’m fairly new to knitting and although I was super excited when I found this pattern (I have the book), I started it…and have been a little lost. I had my grandma sit down and look at the pattern and she showed me how to slip stitches and mark (she suggested I tie a different color yarn around the last stitch because I don’t have markers). Annnnnyway, I came online looking for help, and found the most helpful thing I could stumble across. Thank you! I’m still a novice and was thrilled when I found this pattern. I whipped it out in 2 days (pretty quick for a mama of a toddler! ), but got hung up on the instructions for the hood. I agree with Nancy (comment #4) that the directions were skimped. 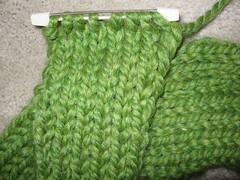 I had to improvise because, like you, I overlooked gauge (I got 2 stitches per inch and 3 stitches per row). I must say that I am pretty disappointed in this project. The narrow stockinette scarf is still too curly for my taste and the hood is awkward. I may try to do it again, improvising even more on the pattern to better suit both my taste and my anatomy! This was really great…I am going to download this pattern and follow along with your blog…I am so bad with winter clothes and I can walk out without a coat on…so this little hat/scarf/mitts would be great for me.